"This one is worth the extra work! I run whole lemons through a Juiceman®, which produces a thick juice that requires diluting equal parts with water. Makes a generous drink I like to put in a fiesta glass." Pour 1/4 to 1/2 inch of sugar onto a small, shallow plate. Moisten the rim of a margarita glass with a wedge of lemon, dip the moistened glass into the sugar; set aside. Pour the lemon juice, 2 teaspoons of sugar, vodka, and triple sec into a cocktail shaker over ice. Cover, and shake until the outside of the shaker has frosted. Strain into the prepared margarita glass, and serve. I didn't use a Juiceman, just an old-fashioned hand juicer. Very lemony-lemon drop. And just the right amount of sweet. Good stuff. I was searching around on this site for a vodka drink and found this tasty drink. 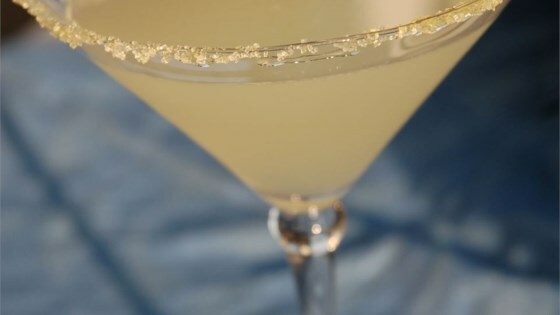 Very nice lemon drop, allows you to make it as sweet as you desire. If you want it sweeter use 2 oz vodka, 1 oz, sour mix, and 1 oz 7-up then add your lemon juice, no triple sec. Drink was harsh, I like a smoother drink. It lacked something. What I don't know? Not bad, I made exactly as written. Actually squeezed the lemons so it was a bit tart. May add just a little extra sugar next time.